We’ll be meeting from 2:00pm to 4:00pm on the following dates. The Evergreen Cultural Centre’s address is 1205 Pinetree Way, Coquitlam, BC. We’ll be meeting in the Rehearsal Hall at the Evergreen Cultural Centre. As in the past, we will have free parking on Sundays and evenings. From Hwy# 1 take exit 44 and take Highway #7 NORTH (Lougheed) towards Coquitlam Town Centre. We are located just north of Coquitlam Shopping Centre at the corner of Guildford and Pinetree. From Barnet Hwy travel east through Port Moody, (along St Johns Street), and Coquitlam (along Barnet Hwy). Turn north (left) on Pinetree Way just east of Coquitlam Shopping Centre. The Evergreen Cultural Centre is located on the northeast corner of Guildford Way and Pinetree Way, four blocks north of the Coquitlam Shopping Centre. Evergreen Cultural Centre has a north and south parking lot operated by the City of Coquitlam. Parking is free on Sundays and statutory holidays. Parking is also free in the designated 30-minute parking spaces. Travelling northbound on Pinetree Way, turn right at the traffic control signal at Town Centre Boulevard. Travelling southbound on Pinetree Way, turn left at the traffic control signal at Town Centre Boulevard. NEW – note that there is no longer access to our south lot (backstage lot) from Guildford. Access to the lot via the North Lot and then via the driveway on the west side of the building. NEW LOT – there is a new City of Coquitlam PAID parking lot located at the SE corner of Pinetree and Guildford. Parking is free after 6pm and on Sundays and statutory holidays. Beginning December 2, 2016, patrons will be able to travel to the Evergreen Cultural Centre on the Evergreen Skytrain Line extension. 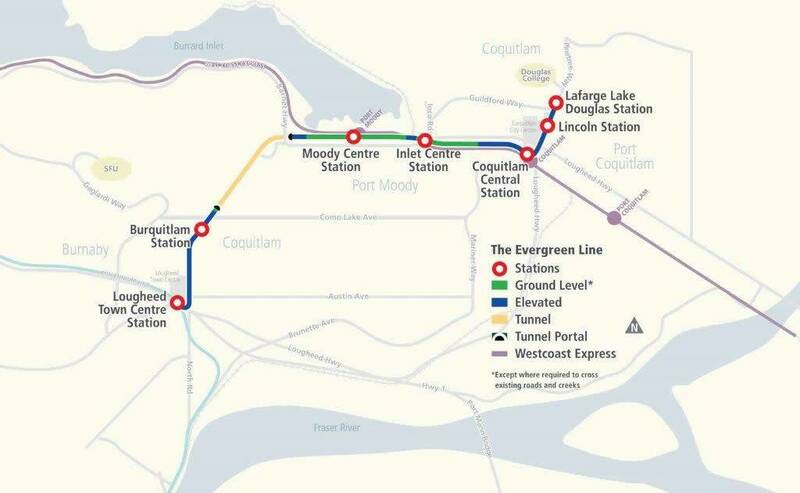 We are located immediately adjacent to the Lafarge Lake – Douglas station at the north end of the Evergreen Line. For more information and a transit schedules, please visit the Translink website. Evergreen Cultural Centre is an entirely wheelchair accessible facility. There are three wheelchair parking spaces next to the drop off area and in close proximity to the centre. 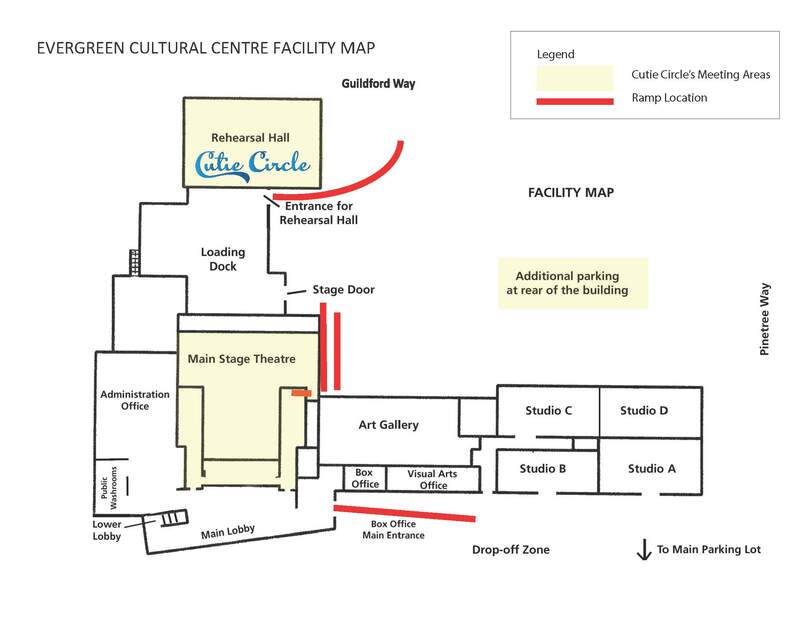 Once you arrive at the Evergreen Cultural Centre, refer to this Facility Map for finding the parking lot, the ramps, the Rehearsal Hall and the Studio Theatre. (Click the image below for a larger version.) The doors to the facility will be opened 15 minutes before our meeting time. This entry was posted in Blog, Events, News, Posts and tagged ウクレレ, Coquitlam, 烏克麗麗, Dates, Event Calendar, Evergreen Cultural Centre, Evergreen Extension, 高貴林, 우쿨렐레, ukelele, Ukulele, 尤克里里, 乌克丽丽 on August 1, 2018 by cutiecircle.